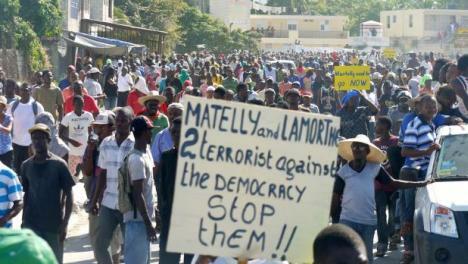 Over the past several months, Haitian citizens have launched demonstrations in the streets of Port-au-Prince. Catalyzed by the government’s failure to hold parliamentary elections for the third year in a row, the protests take broad aim at the failures of the country’s reconstruction efforts. Five years after an earthquake left 250,000 dead and millions more without food or shelter, protests have called for free and fair elections, an investigation of political corruption, the removal of MINUSTAH troops, and the end of what many perceive to be the U.S. occupation of Haiti. In many ways, the protests now serve as a referendum on almost a century of U.S. interventions carried out under the guise of humanitarianism that have eroded economic stability and frustrated political self-determination. In response to protests, the U.S. State Department has remained quiet, only wagging a metaphorical finger at Haiti’s governing body when protests took a violent turn ahead of a scheduled visit from Secretary of State John Kerry. In fact, United States support for President Michel Martelly has been incredibly strong, exemplified by recent comments from former U.S. president and special envoy to Haiti Bill Clinton, praising the administration as the most productive Haitian government to date. This enthusiasm for Martelly has been chiefly in response to the president’s economic recovery agenda. Under the slogan “Haiti is Open for Business,” Martelly has welcomed a flood of U.S. corporations, multinational enterprises, nongovernmental organizations (NGOs), and self-proclaimed entrepreneurs. In the past five years, U.S. interests, including the Clinton-Bush Haiti Fund, the U.S. Agency for International Development (USAID) and the Inter-American Development Bank have invested hundreds of millions into Haiti’s economic recovery. In return, United States companies have been awarded some 1,500 contracts totaling more than $204 million in reconstruction funds. Yet, investment has not taken the form of institution-building and economic diversification, which might cultivate the nation’s capacity to deliver social services, build public schools and employment programs, and redevelop housing. 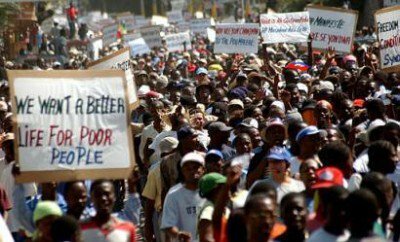 Instead, U.S.-led reconstruction efforts have exploited the urgent need for aid and debt rescheduling to compel the Haitian government to adopt neoliberal reforms which will expand free trade zones, privatize national industries, and deregulate labor relations. Reminiscent of stateside urban renewal strategies that invoked crisis to decimate whole neighborhoods and reorganize municipal economies around service-sector industries, U.S. corporations and their humanitarian proxies (USAID being just one example) have utilized the earthquake to operate in Haiti in much the same way. Alongside these reforms, reconstruction has been pursued through a narrow economic strategy promoting luxury consumption and real estate speculation. Thus, in the past several years, the Clinton-Bush Haiti Fund, a nonprofit organized after the earthquake, has invested millions in posh hotels that cater to NGO workers and the CEOs of foreign investment funds. U.S. corporations have followed suit. In April 2014, Hilton Worldwide announced they would begin construction on a $25 million, 150-room luxury hotel. In December 2014, the Inter-American Development Bank issued a $36 million grant to launch a comprehensive tourism project on Haiti’s southern coastline, hoping to develop artisan marketplaces in the vein of New Orleans’s French Market and Boston’s Faneuil Hall. Incentivized by tax abatements and cheap labor, multinational corporations like Hilton Worldwide stand to make large profits from the new tourism economy. Dependent on foreign aid, Martelly has acted entrepreneurially to promote this pro-investment agenda. Infrastructural improvements, which have included new roads and clean parks, have occurred in areas that offer big symbolic rewards to U.S. developers with new construction projects. On the island of Île-à-Vache, just off the Southern coast of Haiti, the Martelly administration has used coercive measures to force peasants off their land in preparation for new touristic development. Announcing plans for construction of an international airport and 2,500-room resort, to be developed by the U.S.-based Holmes International, the Haitian government declared that they would not honor property rights dating back less than five years. This tactic has been used to clear land swiftly and without cost to the development company. While, Martelly has argued that tourism has the potential to alleviate poverty in the region, this rhetoric is clearly not aimed at garnering the support of Haitian citizens. Rather, it legitimizes the involvement of multinational corporations and aid agencies by linking their presence to a humanitarian agenda. However, those contending that profits will trickle down through job creation and further investment obfuscate the limits of tourism economies, particularly when orchestrated by foreign multinational corporations. Tourism and hotel development is highly uneven, generating large profits for investors, but rarely translating into economic security and mobility for residents. While the Martelly government has willingly provided a steady stream of tax incentives, tariff reductions, and free trade agreements, these arrangements reduce the redistributive potential of new capital by diminishing state revenue. As the Haitian state assumes the risk under foreign aid, private investors get all of the benefits. Thus, schools remain underfunded, clean water scarce, and the majority of citizens in poverty amid the building of multimillion-dollar hotels. At best, this kind of development offers low wage and dead end jobs to individual residents. At worst, it destroys pre-existing economies and diminishes the options of already impoverished people. The latter may represent the fate of residents on Île-à-Vache, where construction of the resort and airport will, in all likelihood, destroy the peasant economy. As many have already been forced off their land, new building threatens to pollute fishing areas and tarnish the fragile ecosystem making subsistence farming untenable. While peasants have mobilized in protest, they will have to find work in low-wage tourism jobs or migrate to overcrowded urban centers as their way of life disappears. Additionally, the centerpiece of U.S. post-earthquake economic investment, a manufacturing plant in Caracol that cost nearly $300 million in foreign aid and was funded by the Clinton-Bush Haiti Fund, has produced just five percent of projected employment. Workers have reported receiving threats of termination if they do not comply with sweatshop-like conditions, including unpaid overtime. Yet, a U.N.-sponsored report written in favor of Caracol’s construction noted that the area was ripe for development precisely because of the unique combination of extreme poverty and unregulated labor conditions. Of course, none of this neoliberal style of development is new to Haiti. In fact, the United States and other foreign powers have been pushing Haiti to adopt a platform of free market practices and privatization for nearly 50 years. Beginning in the late 1970s, and coinciding with stateside efforts to deregulate markets and bust unions, the United States, in concert with the International Monetary Fund (IMF), has pressured the Haitian government to reduce import tariffs in exchange for aid. This has sparked an influx of cheap staples (including American rice during the Clinton years) that has undercut peasant economies and precipitated an ever-growing trade deficit. With the goal of enacting privatization, the Clinton administrations agreed to return president Jean-Bertrand Aristide to power following a 1991 military coup if Aristide would initiate the sale of nine state-owned companies and accept structural adjustment. When, in turn, Aristide announced he would not privatize state-held industries, but instead implement antitrust laws to allow for competition, the U.S. withheld $500 million in aid. In the last ten years, due to increasing foreign debt, U.S. corporations have been able to take over more and more of the nation’s industries. However, U.S. interests have used the earthquake as a crisis to break up public agencies and demand private oversight of the economic recovery. As U.S. capitalism extends beyond its territorial boundaries, growth has occurred through grossly uneven and wholly undemocratic means. This action can be perceived as an extension of processes that have reorganized U.S. cities around uneven development over the past 40 years. In those cities, hollowed out by white flight and deindustrialization, and restructured by drastic cuts to public employment and social welfare spending, local governing officials have been forced to favor private sector investment over meaningful redistribution. Thus, following the earthquake, the demand that Haitian officials privatize remaining national interests echo similar demands on city services in New Orleans, Detroit, Newark and elsewhere. Similarly, the wholesale privatization of New Orleans’ public school system is actually the model that is being used to rebuild Haiti’s schools. In Haiti, where economic recovery is orchestrated by foreign investment, the imbalance in capital and the country’s growing debt, continue the Haitian state’s dependence on the interests and preferences of foreign investment. Under this arrangement, the state’s capacity to generate redistributive economic options and progressive state sovereignty diminish. Nevertheless, the protests have had some success. The demonstrations have forced the resignation of Prime Minister Laurent Lamothe—who has been at the forefront of encouraging foreign investment—and secured the promise from state officials that elections will be held by May of 2015. While the U.S. media has been inclined to interpret these struggles as a sign of political meltdown, they could alternatively be perceived as a mechanism to combat the hegemony of neoliberalism. 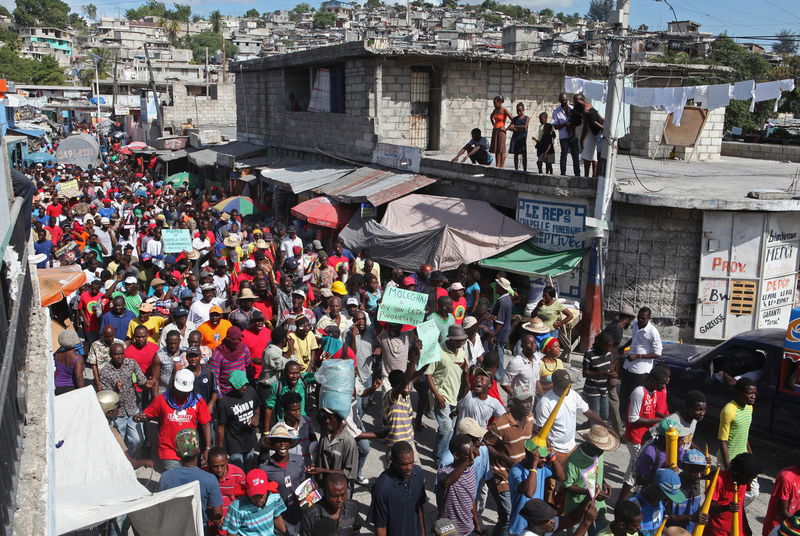 By linking internal political corruption, economic imperialism and the development of tourism, those on the streets of Port-au-Prince may be at the forefront of demanding an alternative. Megan French-Marcelin holds a PhD in urban history from Columbia University. Her scholarship focuses on US urban policy, inequality, and social movements. She resides in Brooklyn, NY. Prev East of East: Mapping Community Narratives at Mountain View H.S. And here we are again. . . after operation: Occupy and Devastate.